If you need a website, there are plenty of ways you can get one. You could create it yourself, although if you lack the time or skills required, that may not be a feasible option. Your best solution may be to hire a professional, but figuring out how to find the right one and get the process started can be daunting. To hire a web design professional, you’ll not just need to find one who can do the job, but you’ll also need to do some preparation work. This involves planning out your project, knowing what you’ll need, and determining what you can afford to pay. In this article, we’ll guide you through the process of hiring a web designer to create a custom website. We’ll talk about what you should consider beforehand, how to create a plan for your site, and how to manage the project. 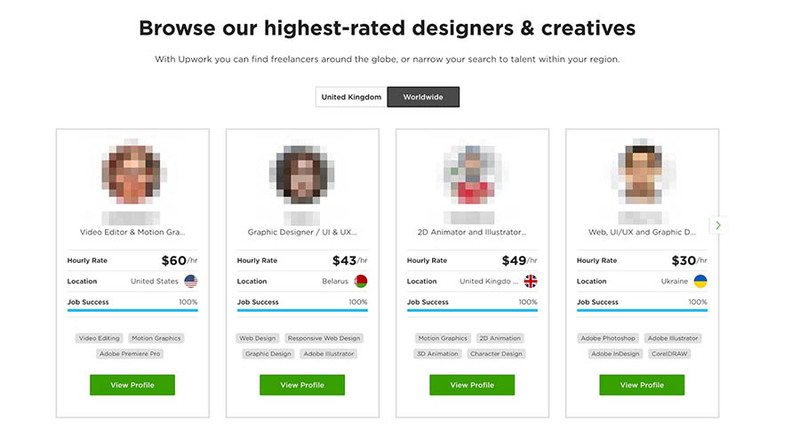 Finally, we’ll show you how to find a designer that’s right for you. Let’s get to work! 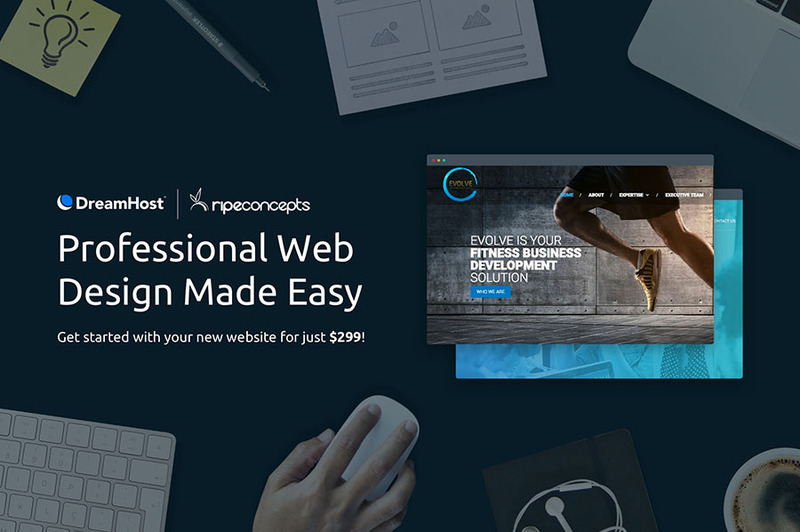 It’s true that it has never been easier for just about anybody to create a website. With little-to-no help, even inexperienced people who have never touched a single line of code or a design tool can create functional and attractive sites. This is mainly due to the many applications and platforms that take care of the technical aspects of site creation for you. For example, many website builders let you use templates combined with a drag-and-drop interface to build pages and create content. Even Content Management Systems (CMSs) like WordPress are easier than ever to use, thanks to one-click installs, themes, and plugins. However, constructing a site by yourself is still not always feasible. Even with all those tools at your disposal, for example, you’ll still be required to learn the basics of site design and know how to use your chosen software correctly. Even if you know exactly what you’re doing, many websites take a considerable amount of effort and time to construct. The right tools can help you along the way, but if you don’t have the time to spare, that won’t matter much. It may also be that you need a site with scope and functionality that goes beyond what pre-existing assets, such as themes and plugins, can provide. For example, you might feel comfortable putting together a personal blog or portfolio. However, creating something more complex, like a membership system or e-commerce store, may not be within your comfort zone. In these cases, your best option is almost always simply to hire a professional for the job. There are plenty of designers available with the skills, talent, and experience to create precisely the site you need while letting you focus on other aspects of your venture. Hiring a designer also comes with several other potential benefits. For instance, they’ll often be able to not only design your site but also help you with creating additional design elements, such as logos and other visual assets. They may even be able to help construct your brand’s visual identity, which is a great way to gain traction quickly. Once you’ve decided to hire a professional to create your website, you’ll need to start planning it out. It’s extremely vital that you know precisely what you want out of the final result, so the designer can make it a reality. A clear plan will help you convey to them what your expectations are, how you want the final product to look, and what exactly you’re paying them to create. First and foremost, you’ll need to define your goals and the site’s purpose. For example, is your new site a commercial venture, such as an online store or a company site, or is it more of a personal project? From there, you can start deciding what you want from your site, how it should look, what type of content it will contain, and what functionality it will require. The size and level of your site’s intricacy are equally important to nail down at this early stage. For example, a basic but crucial question to consider is how many pages you want it to contain. The more pages you need, the larger the scale of the project will be. In turn, the answers to all of these questions will help you when it comes to what is arguably the most important point of all: budget. 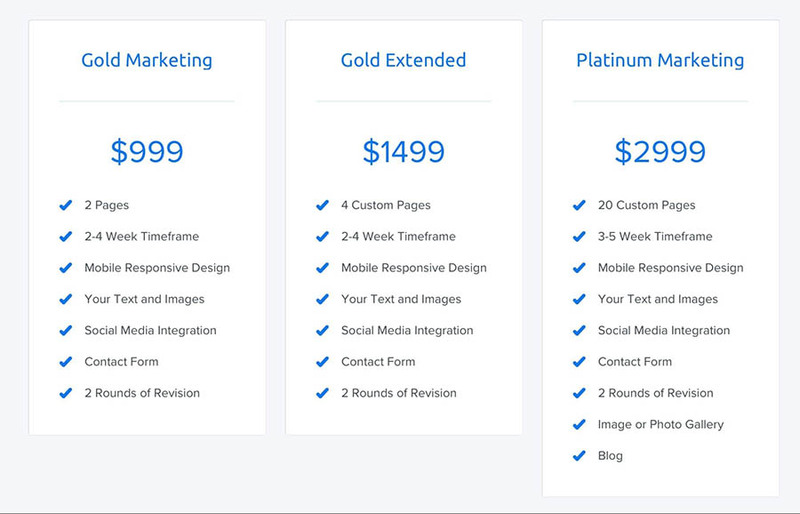 In short, how much can you afford to spend on your site? 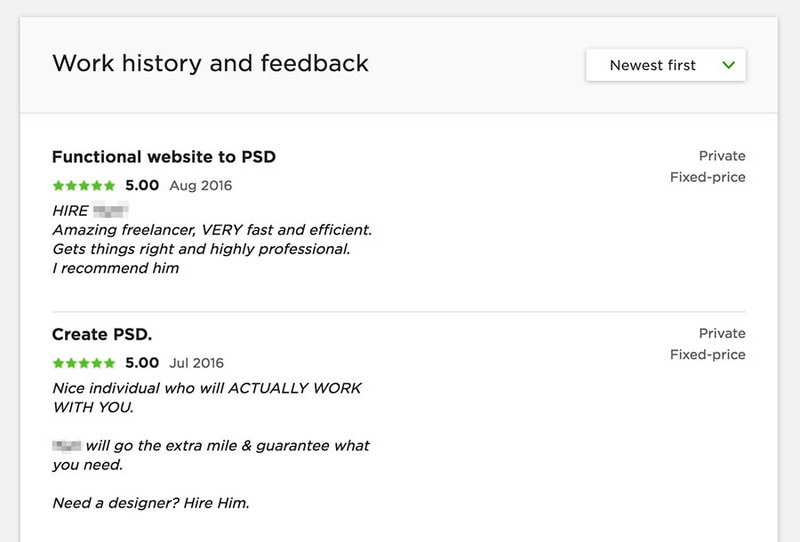 This will not only affect who you can afford to hire for the job, but if you should approach a single freelancer or reach out to an agency with multiple designers and developers. These are only a small handful of considerations, but they represent a solid start for planning out your project. We’ve previously discussed the ideal game plan for designing a site at length, so we recommend that you check out that advice as well. While it’s crucial to plan for your website, it’s equally critical that you know how to manage the project once your designer has started working on it. Not only will this ensure a smooth workflow for all involved parties, but it will also help to prevent miscommunications or any unwelcome surprises. Be clear about your goals. Once you’ve defined your goals, don’t be ambiguous about them. Clearly communicate what you want, including your overall vision for the site, and what specifically you’re asking the designer to produce. This will ensure that they know what’s required of them upfront, increasing the odds that you’ll be happy with the result. Provide them with all the required information and assets. It’s also vital that your designer has the right information and tools needed to complete the work. What this means will naturally depend on the specific project’s requirements, but could include elements like art assets, photos you want to use, content, product information, and so on. Understand what’s involved in the process. Even if you’re not directly involved with the site design process, it’s still helpful to have a general grasp of what it entails. If you understand the general steps involved, you’ll have a much clearer idea of your project’s timeline and a better understanding of the work your designers are doing. Create a clear roadmap for the project. Speaking of timelines, you should also aim to define a clear roadmap, including deadlines and milestones. Make sure you’re realistic about your expectations, both when it comes to workload and the final product. Communicate clearly throughout the project. We’ve discussed the importance of this already, and fortunately, it shouldn’t be difficult to do as long as you’re using a medium that works for everyone involved. It’s best to decide upfront what your primary channels of communication will be, whether that’s email, phone, or an application. Be clear about the project’s budget. In short, everyone should know exactly what they’re being paid to do and how much they’re getting. This will help avoid situations where you’re faced with unexpected extra charges down the line. At the end of the day, it’s essential that both you and the designer are in sync when it comes to expectations and goals. As long as you plan thoroughly and communicate well throughout the project, this shouldn’t be too difficult to achieve. By now, you should have a better understanding of when and why you should consider hiring a designer for your website. We’ve also discussed how to prepare for the project. All that’s left is to look at how actually to go about finding and recruiting one or more designers. There are two primary avenues available to you, so we’re going to discuss each one in turn. When you have a plan in place and know what you want, it’s time to start finding the right person for the job. Many people decide to hire freelancers to build their websites, and it’s not hard to see why. There are a lot of them to choose from. In fact, over 53 million Americans work as freelancers. Going with the freelance option has a few benefits. For one, you can look for someone who specializes in exactly the type of project you require and get a feel for their stylistic sensibilities by looking at examples of their previous work. They also tend to offer plenty of flexibility when it comes to the scope of the project, working hours, deadlines, and budget. If your budget doesn’t stretch very far, you may also be able to find less experienced freelancers who will work for cheaper than an agency or more prominent competitors. That said, this doesn’t mean you shouldn’t pay them what they’re worth or suggest that they work “for exposure.” It just means you might be able to spend less, and they get a chance to earn money while gaining more experience in the field. However, using one or more freelancers can also have its downsides. For one, you may be limiting the potential scope of your site, especially if you can’t afford to hire multiple designers. If you do hire more than one person, on the other hand, this might make the process of managing the project more difficult, as communication can become fractured across multiple parties. You may also find that if the parameters of your project change, the designer may not have the necessary skills to handle any new requirements. If you decide you want to use a freelancer to design your site, there are plenty of ways to find the right one. There are many sites dedicated to connecting specialized freelancers with projects that match their skills, such as PeoplePerHour, Guru, and Upwork. The latter in particular is a terrific option. 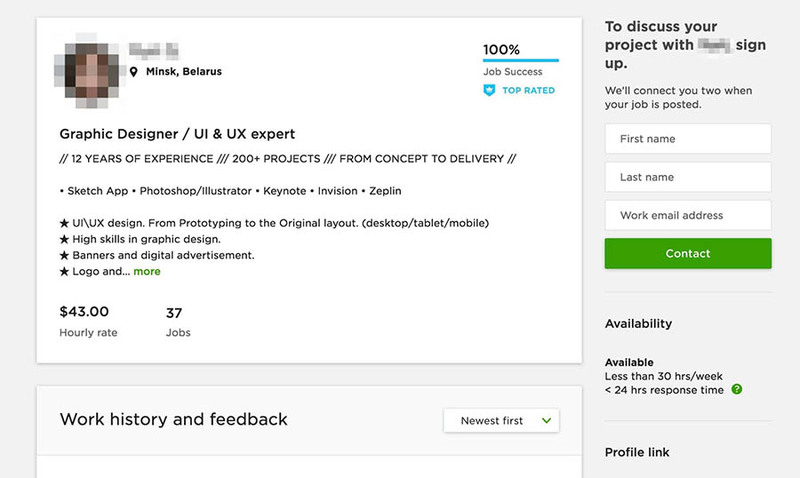 On Upwork, you can browse for suitable candidates and view their profiles to see more information. When trying to find the right candidate, it’s a good idea to study each prospect’s portfolio carefully. Are the sites they’ve created similar to what you have in mind? This also gives you a chance to see what their skills and weaknesses are, which will make it easier to understand if they’d be a good fit for the job. Similarly, you should also look for reviews and recommendations, including testimonials. In addition to giving you valuable information about their abilities, this will also provide you with an idea of what it’s like to work with that person. You’ll naturally want to look for skills like strong communication, flexibility, reliability, and so on. Once you’ve found a freelancer you’d like to approach, you can use the contact form to get in touch. However, you may not even need to do that, as Upwork will help you find suitable freelancers when you post a job. You can then use the same interface to communicate, transfer files, and even handle payments. If you find that a freelancer alone is not able to fulfill your requirements, or you simply want a more complete solution including additional work beyond website design, the best option is to hire an agency. Working directly with an agency has a number of advantages, including expanding the potential scope of your project. These types of firms will usually have teams of employees who can create much larger sites with advanced functionality. They also tend to offer additional services, such as helping you build visual branding for your website and business. A design firm also provides more reliability than freelancers do. For example, if you hire Freelancer X and they’re unexpectedly incapable of proceeding with the work due to illness or other external factors, you’re in trouble. However, with an agency, you can always rest assured that the job will get done. The major hurdle with using this option is naturally the price. However, even in this regard you have some freedom, as you can scale the final cost to match your budget. Let’s actually look at how this works with DreamHost’s own design services. We’ve partnered with RipeConcepts, one of the world’s leading web design firms, to provide several different design services to our customers. By choosing one of these packages, you can have professional designers create your site for you. You can opt for a simple microsite with basic features for as little as $299. Or you can create a fully-functional e-commerce solution, including a blog, image gallery, up to 20 custom pages, social media integration, and responsive design. DreamHost also offers branding services, where our designers create a logo, business cards, email signatures, and even a branded letterhead for you. Combined with our other design services, this lets you create an entire visual identity for your brand and website in one go. Finally, we also provide optional add-ons, which enable you to select additional features you want to include on your site. 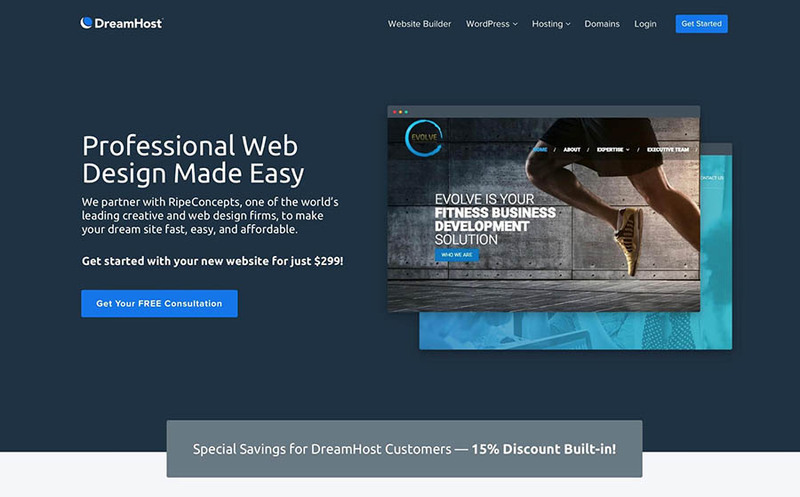 Considering the scope of what these packages offer, combined with the tiered options, this is an easy and price-effective way to get any type of website off the ground — especially if you’re already a DreamHost customer. Sometimes it’s best to rely on professionals to create your website. However, to make sure you get the results you need, you have to come prepared. You’ll also need to know where you can find the best designers, and how to spot which ones provide services that match your requirements. Do you have any questions about hiring a designer, or any of our web design packages? Let us know by starting the conversation in the DreamHost Community forum!